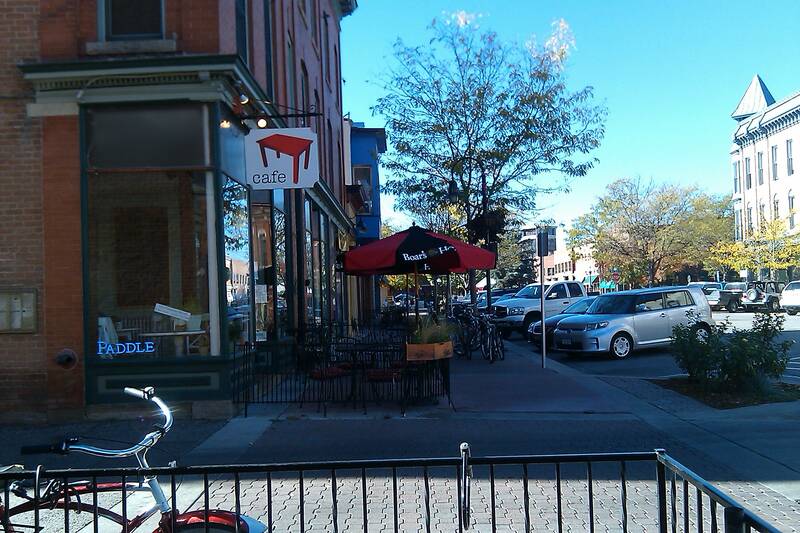 The last time I was in Fort Collins, Colo., I was looking for a pair of 501 Levi jeans. And my only memory of the place was that it was somewhat of a cow town. But I was in Fort Collins again last week, and my impression was totally different. I don’t think I’ve ever seen such a vibrant downtown — especially for a city that size. According to their visitor’s guide, the population was just 137,000 last year. The downtown had parking on both sides of the streets AND in the middle, in some places, and not a parking meter in sight (!). The sidewalks were wide and inviting, with lots of trees and green space and bike racks. But most impressive was the wealth of local, independent stores — not just on the main drag, College Avenue, but on side streets and parallel streets. Ten local stores for every chain store, it seemed. What does that matter? I always assume it’s better for the economy for a local guy to pocket the revenue, rather than a corporate owner in another state. And they were unique, funky stores with names like the Drunken Monkey, killer rabbit, Kansas City Kitty and the Spicy Pickle. How can you resist checking out stores like that? My personal favorite was Al’s Newsstand and Smoke Shop, which sold every magazine imaginable. The store has been there since the 1940s. At the risk of a public storning, I’d venture to say that Lincoln’s downtown is still stuck in that stage: There are too many bars and chain stores, too many empty gaps. O Street is a wicked busy street, not a pedestrian-friendly thoroughfare at all. The city has a downtown master plan that envisions Q Street becoming a “retail corridor” like Fort Collins’ and some developers — notably WRK — have made progress toward that end, but there are still too many national chains and not enough momentum. The Haymarket comes close, but it isn’t there yet. You can go the Black Market… and then what? Get in your car to drive to the other side of downtown to check out Stella’s unique clothing, and go across the street to the Post & Nickel. It’s not enough to make you want to go downtown again and again and again. It seems a vibrant downtown has critical mass. In other words, if more of our local stores were centralized, whether in the Haymarket, or Q Street, wherever, Lincoln needs a destination point. Omaha’s Old Market has it. The Haymarket certainly has the potential to get it. The question is, how does “it” happen? In Omaha, it seems to have happened organically. 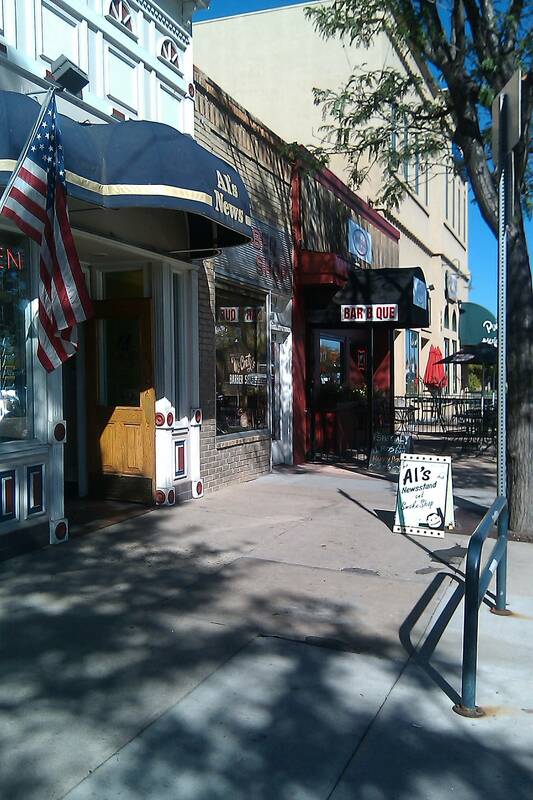 The owner of a Fort Collins shop said the city has a very strong downtown business group, and the strength of the downtown tends to snowball. He chose to locate there because it was so vibrant and strong. Lincoln needs to figure out how to get “it.” It’s not as if the city hasn’t tried. 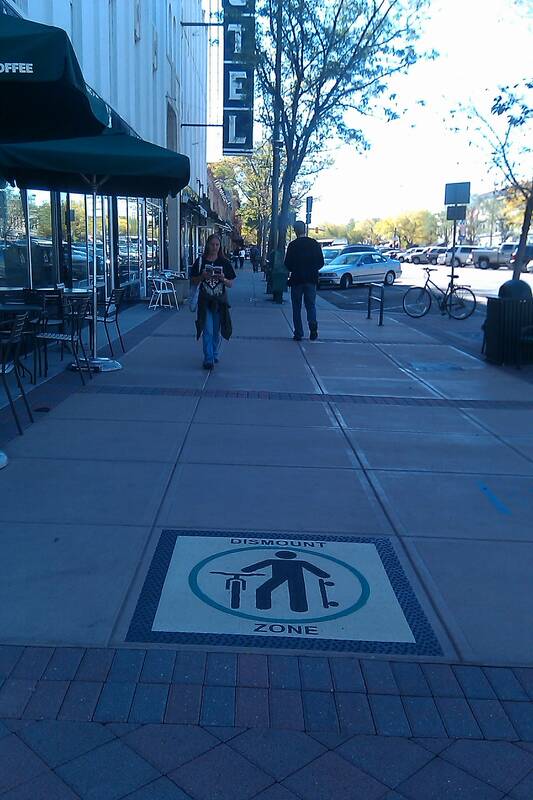 It has a master plan calling for wide sidewalks with trees and pedestrian-friendly promenades (like Fort Collins’). But city officials seem to have a heck of a time getting those plans accomplished. The city’s attempts to require a downtown hotel plan to include those features (as dictated by the master plan) was largely stymied by the developers. And the mayor’s office is so intent on shaking the city’s reputation for being anti-business that it tends to quickly bow to developers’ demands in a situation like that. The city has installed just a few bike lanes downtown — very tentatively and hypersensitive about negative reaction — while Fort Collins has them everywhere and that’s probably why they’re ranked “gold level bicycle friendly.” Its downtown sidewalks are imprinted with “dismount zone” to remind bicyclists to be polite. 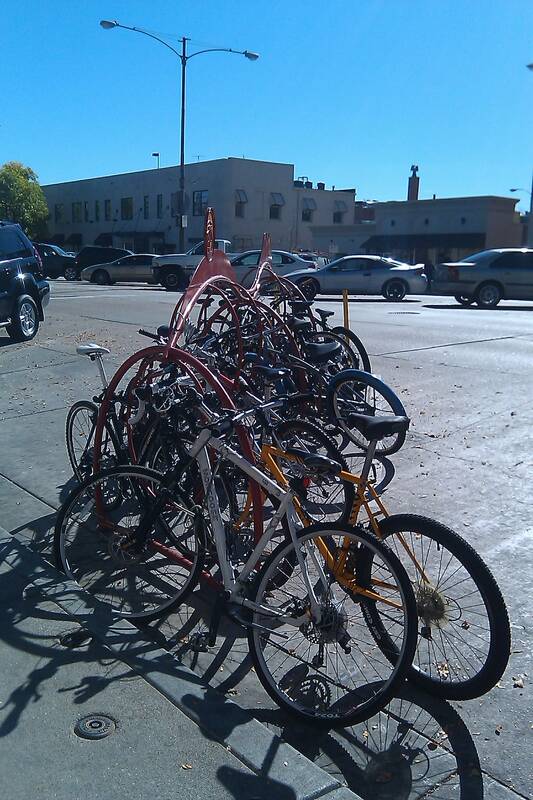 In Fort Collins, bike racks are everywhere downtown, and they’re used. Lincoln officials know all about the importance of becoming more multi-modal and bike-friendly — I have no doubt they know exactly what it takes to become everything Fort Collins is, but it seems to take an act of Congress to get there. The mayor’s office is so fearful of criticism that city offices seem paralyzed sometimes. The downtown master plan will never be foisted upon businesses, out of fear there would be revolt. However, if Lincoln ever wants its downtown to be more than a bar crawl, it’s going to have to get bold about it. Or pray that people make it happen on their own.